I can't give the correct number of parameters of AlexNet or VGG Net. For example, to calculate the number of parameters of a conv3-256 layer of VGG Net, the answer is 0.59M = (3*3)*(256*256), that is (kernel size) * (product of both number of channels in the joint layers), however in that way, I can't get the 138M parameters. So could you please show me where is wrong with my calculation, or show me the right calculation procedure? If you refer to VGG Net with 16-layer (table 1, column D) then 138M refers to the total number of parameters of this network, i.e including all convolutional layers, but also the fully connected ones. the two other ones have N=256 input planes and F=256 output planes. 256x3x3x256 (weights) + 256 (biases) = 590,080 parameters for the two other ones. As explained above you have to do that for all layers, but also the fully-connected ones, and sum these values to obtain the final 138M number. (x) see section 3.2 of the article: the fully-connected layers are first converted to convolutional layers (the first FC layer to a 7 × 7 conv. layer, the last two FC layers to 1 × 1 conv. layers). [...] the spatial padding of conv. layer input is such that the spatial resolution is preserved after convolution, i.e. the padding is 1 pixel for 3×3 conv. layers. With such a padding, and working with a 224x224 pixels input image, the resolution decreases as follow along the layers: 112x112, 56x56, 28x28, 14x14 and 7x7 after the last convolution/pooling stage which has 512 feature maps. This gives a feature vector passed to fc1 with dimension: 512x7x7. A great breakdown of the calculation for VGG-16 network is also given in CS231n lecture notes. Then number of paramters #= (n*m *k+1)*L in which the first contribution is from weights and the second is from bias. During training, the input to our ConvNets is a fixed-size 224 × 224 RGB images. The only preprocessing we do is subtracting the mean RGB value, computed on the training set, from each pixel. The image is passed through a stack of convolutional (conv.) layers, where we use filters with a very small receptive field: 3 × 3 (which is the smallest size to capture the notion of left/right, up/down, center). The convolution stride is fixed to 1 pixel; the spatial padding of conv. layer input is such that the spatial resolution is preserved after convolution, i.e. the padding is 1 pixel for 3 × 3 conv. layers. Spatial pooling is carried out by five max-pooling layers, which follow some of the conv. layers (not all the conv. layers are followed by max-pooling). Max-pooling is performed over a 2 × 2 pixel window, with stride 2. A stack of convolutional layers (which has a different depth in different architectures) is followed by three Fully-Connected (FC) layers: the first two have 4096 channels each, the third performs 1000-way ILSVRC classification and thus contains 1000 channels (one for each class). The final layer is the soft-max layer. 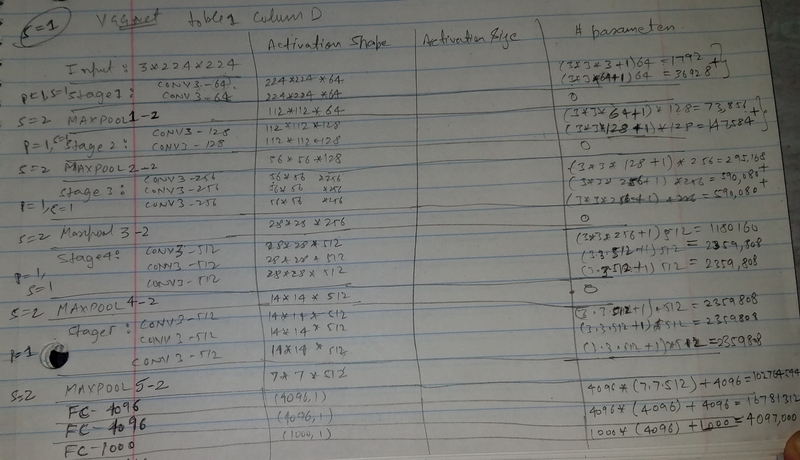 A formula to find activation shape of a layer! CONV3: means a filter of 3*3 will convolve on the input! Cin : means the depth a.k.a channel coming from the input layer! Cin and Cout are the number of filters that you stack together to learn multiple features at different scales such as in the first layer you might want to learn vertical edges, and horizontal edges and edges at say 45degree, blah blah!, 64 possible different filters each of different kind of edges!! n: input dimension without depth such n=224 in case of INPUT-image! f: filter size i.e 3*3 for CONV and 2*2 for MAXPOOL layers! After MAXPOOL5-2, you simply flatten the volume and interface it with the first FC layer.! Finally, if you add all the weights calculated in the last column, you end up with 138,357,544(138 million) parameters to train for VGG-15! Not the answer you're looking for? Browse other questions tagged machine-learning neural-network computer-vision vgg-net or ask your own question. Why is tensorflow consuming this much memory? How to count (roughly) the number of nodes/neurons/activations in an existing neural network?